Alberto, a Colombian migrant working illegally in London to pay for his mother's operation back home, becomes convinced that God has a destiny marked out for him. This is a taught, poignant thriller with a captivating supernatural twist. A £25,000 reward offered by a local newspaper brings documentary makers Matt and his girlfriend Georgia to the remote North Devon moor in a bid to capture the fabled Beast purported to be a wild cat, like a panther or a puma on film. 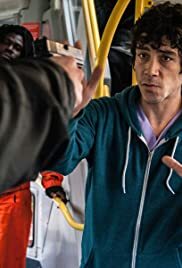 In a world of mounting uncertainty obsessed with knowing the future, we find Alberto (Óscar Jaenada), a Colombian immigrant working as a massage therapist in London. With the looming mayoral election bringing seething ethnic tensions to the boil, Alberto - mild mannered, almost shy - blends into the multicultural city. He came to Britain to pay for his mother's operation back home, but the streets of London are not paved with gold, and he finds himself trapped in a vicious circle. Fervently religious, living in hiding, and tortured by visions from his past, he becomes convinced that God has a destiny marked out for him. This is a taught, poignant, East London-based thriller with a captivating supernatural twist.